Surveyor General of India, Lt General Girish Kumar has assured to assist and extend all possible technical expertise in the field of geospatial domain to improve the developmental planning, monitoring and management of natural resources in Arunachal Pradesh. 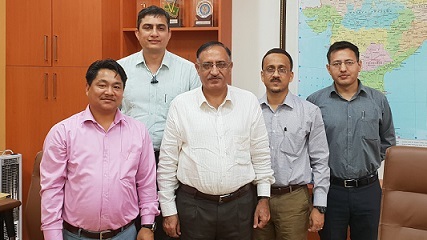 He assured this to a team of State Remote Sensing Application Centre (SRSAC) that visited his office chamber at Dehradun in Uttarakhand on August 23. The team was led by the centre’s Director H Dutta accompanied by Deputy Director Tana Tage. Lt General Kumar expressed his keen interest in collaborating in geospatial technology with the SRSAC for village level survey using spatial data module structure developed for mobile mapping application, mapping of five major river basins, currently taken up for the Brahmaputra basin under National Hydrology Project funded under World Bank assistance. He also expressed his willingness to provide technical expertise for DEM generation with vertical as well as horizontal accuracy for flood modelling geo database of 1.2 K scale, flood forecasting, observation of water reservoir in real time, creation of Geoidal Model of 10 cm and establishment of Continuously Operating Reference Stations network sites in Arunachal Pradesh for government agencies that collect GPS data to improve precision and accuracy of positions, which are useful for supporting three dimensional positioning, metrology, space weather and geographical applications. Citing example of Geospatial Smart Village recently developed by China, Lt General Kumar said that accurate village-level information is not available from ground level to improve infrastructure planning, utilities management, etc. Therefore, he emphasised on using geospatial techniques to help the State government identify villages lacking in basic infrastructure and ensuring their all-round development at micro level. On invitation from the State government, he assured to visit the State in October this year once modalities get completed for collaboration and sharing of geospatial technologies between the Survey of India and SRSAC Arunachal Pradesh for signing of MoU. Sharing working experience on geospatial technology, Dutta said due to diversified topography and varied agro-climactic conditions of the State, it offers vast potential adding that it also provides a challenge in the inventory, mapping and monitoring of diversified resources of the State. “In that context, advanced state-of-the-art space technologies like remote sensing (RS), Geographical Information System (GIS), Photogrammetry, and Global Positioning System (GPS) can play significant role,” he said. He further said that geospatial data sharing under the existing National Spatial Data Infrastructure (NSDI) of the Union Ministry of Science and Technology, SRSAC is working on establishment of a “central hub” to maintain RS and GIS inventories information on current and planned GIS application. “Volunteered geographic information” through crowdsourcing and public awareness, he said, would help in maintaining the geospatial data of Arunachal Pradesh comprising GIS platform, computing and networking infrastructure for the State GIS. Different level of feature collection with proper standardisation and attribute can be helpful to connect with many sources of data, which is going to make more effective solution, he added. “The current challenge in Arunachal Pradesh is the lack of source of Point of Interest. Therefore, we remain one step behind in the decision-making process,” Tage said, adding that as a nodal agency of Arunachal Pradesh, SRSAC wants the help of SOI as technical solution provider with proper guidance to make the State richer in terms of metadata. On procurement of 1.3m satellite data for daily monitoring and 80 cm half-yearly for base map through the Department of Space’s NRSC (ISRO) from the Planet Lab, Tage said that it would envisage a state-of-the-art centralised GIS infrastructure enabling the user line department to access, process and view spatial data, hosted centrally and leverage the solutions. “GIS nodes shall be made operational along with all the applications, which will allow the users to access digital image and remote sensing packages from anywhere free of cost,” he added. The Secretary Technical to SGI and Deputy Director (Technical) of Survey of India, Pankaj Mishra attended the meeting.